William Sellers aims to expose a new generation to America’s origins. 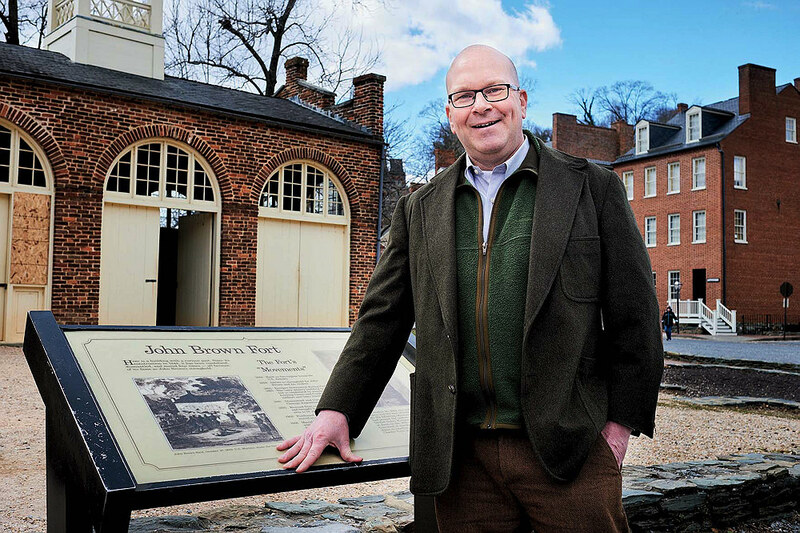 Walking through Harpers Ferry, West Virginia, William W. Sellers ’90 stops at the brick guard house where abolitionist John Brown was captured in 1859. Brown had raided the federal armory there, intending to arm local slaves and lead an insurrection. He failed: seven people were killed, others injured, and he was hanged for treason and murder. But historians agree the event and Brown’s divisive impact helped tip the nation into a civil war. The 100 academy students, chosen from top-performing candidates across the country, will learn American history, from the Native American settlement era through the civil-rights movement, with an emphasis on significant events and figures between 1765 and 1865. The group will alternate between classroom studies and visits to 42 sites within the Journey Through Hallowed Ground National Heritage Area. The 180-mile corridor west of Washington, D.C., designated by Congress in 2008, runs from Gettysburg, Pennsylvania, and Harpers Ferry south to Charlottesville and Monticello, in Virginia, and east to the Manassas National Battlefield Park. It counts more than a thousand historic places—including nine presidential homes and sites and 18 national and state parks—along with the “symbolic and spiritual heart of the Appalachian Trail,” according to Sellers. A lawyer and history-lover, he joined the organization in 2015 after five years as president of Wentworth Military Academy, founded by his great-great-great grandfather in Lexington, Missouri. “Everyone I’ve talked to” about the academy thinks it is “exactly the right kind of program at exactly the right time,” he says. “Half the adults in this country can’t name the three branches of government.” In their first week, during a visit to the National Archives, students will hear about the Magna Carta and the U.S. Charters of Freedom (the Declaration of Independence, the U.S. Constitution, and the Bill of Rights) from private-equity executive, philanthropist, and history advocate David M. Rubenstein. (The Harvard Corporation member owns the copy of the Magna Carta on display at the Archives.) They’ll also tour the Smithsonian’s National Museum of American History with its former director, Brent D. Glass, a Sellers friend who is a primary adviser on the academy project. Sellers’ classmate Jason Cogan ’90 was hired this spring (he applied not knowing Sellers was involved in the project, and they did not know each other at Harvard) to direct the academy. The program's teachers will lead the “place-based, experiential” learning using the case-method “History of American Democracy” curriculum created by Cherington professor of business administration David A. Moss (see Open Book , January-February 2017, page 63). Moss himself will teach the first case, on James Madison, the making of the U.S. Constitution (1787) and the ‘Federal Negative,’ (a proposal, supported by Madison, to enable Congress to veto laws passed by state legislatures) on site at Montpelier, Madison’s home in Orange, Virginia. In developing the academy, Sellers is also motivated by the “assault on facts” and “willful ignorance of the foundations of American democracy” pervading the current political climate. And he’s attuned to the often-facile dismissal of historic figures, an issue he’s also tackling as a father. Major General John Buford is honored near Gettysburg National Military Park. Interpretations of historic figures do shift with the times: Sellers recalls reading Arthur Schlesinger’s The Age of Jackson in college—“and he was a New Deal hero for the Democratic Party.” Continuing reexaminations can be healthy and constructive, he certainly agrees, yet he’s also troubled by what he sees as people’s inability or unwillingness to explore the whole picture. A resident of Eliot House (where he met his wife, Lori J. Curcio ’89), Sellers was a gregarious undergraduate with a wide range of friends. He was proud to make the football team, as much to play as “because I love the history of football, too.” But he was far from a star. “Coach Leo Fanning once told me, ‘Billy, you got all the desire and determination, if you only had the talent, you’d be at Notre Dame,’ which he meant as a compliment,’” Sellers says, laughing. After graduating, he taught and coached at Wentworth, and in 1992 ran the re-election campaign for then-congressman Ike Skelton, a Wentworth alumnus and family friend. He earned a J.D. from the University of Missouri Law School in 1997—Curcio, now a practicing attorney, had earned hers from the University of Virginia in 1996—and they married a year later on Boston’s North Shore. The church was topped with a bell cast by Paul Revere, Sellers notes, and they held the reception at Woodman’s, a beloved fried-seafood joint in Essex. He moved his family into his own childhood home, and spent the next five years stabilizing the institution: expanding the affiliated community college, adding new degree programs like homeland security, reintroducing athletics, and recruiting more foreign students. The reprieve was temporary, though; Wentworth closed last May. That was painful, but his service had opened up a new professional path in strategic development, fundraising, and education. He worked for a nonprofit consulting firm in Kansas City between 2013 and 2015 before taking on the challenge of reorganizing and further developing the Journey Through Hallowed Ground National Heritage Area. The area includes affluent Loudoun County—the wealthiest in the country, anchored by Leesburg, Virginia, only about 40 miles from the National Mall. Driving from Harpers Ferry to Leesburg, near the organization’s headquarters, Sellers points out horse farms and old stone barns and estates, rolling hills, and croplands, along with the commercial wineries that have grown up during the last 15 years. “A lot of this area is pristine,” he explains, with large tracts under conservation easements. Scenic byway Route 15 is an unofficial demarcation line in the county between the more rural landscape and the sprawl encroaching from Washington, D.C. The preservation movement coalesced quickly in 1993 when the Walt Disney Company announced its plan to build an American history-themed amusement park about five miles from the Manassas battlefield. “People thought, ‘Why do we need all this fake history right in the middle of all this real history?’” says Sellers—and were justifiably concerned about the impact of associated commercial development. The theme park was canceled, but the threat helped push lawmakers to designate the heritage area, which is a nonprofit private-public partnership: about $300,000 of its $1.5-million budget comes from the National Park Service; the balance from donations.